In 1913, Highbury corner was nothing more than a stretch of fields with a few buildings around it. On the lower corner was the small Council Chambers (on land bought for £16), the Shepherd home on one corner, the Taylor’s farm on another and orchards all around. 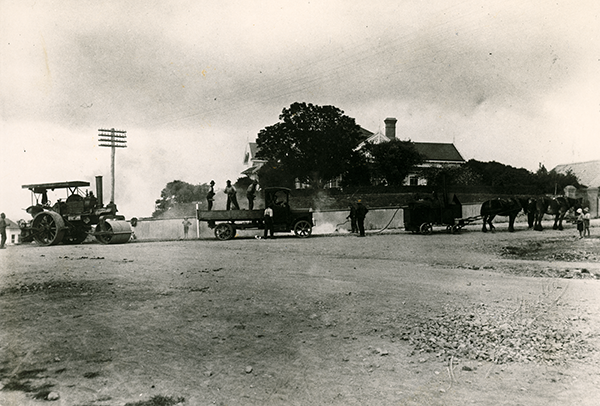 The roads on the corner were later sealed in the 1920s, which aided transport around the area. After this the corner developed as the heart of the village, with all the roads joining at this one corner. This was prior to the days of the Highbury Bypass, so all traffic travelling past Birkenhead had to go through the village itself. An impression of a visitor to Highbury Corner in 1927 was published by the Birkenhead Business Association: “Higher up the hill many charming homes with their well set out grounds attract the eye and tempt one to break the tenth commandment. Oh, how one would be able to settle down in Birkenhead and have a house with an outlook over the Waitemata such as there is from here. “Ha! This is Highbury Corner, is it? How different from what it was a few years ago. This evidently is going to be Birkenhead’s shopping centre – not the Post Office end as one would have judged a few years ago.” Much of the development of Highbury as a shopping centre has been credited to W.H Payne, a local man with a foresight that many people of the day perhaps lacked. On the corner of Rawene and Mokoia roads is the site where the Shepherd Homestead was located in the early 1900s. Henry Medland Shepherd was a wealthy landowner and Sharebroker of the time; he owned various pieces of land throughout Birkenhead. His grand home sat proudly on the corner, set back from the road with substantial grounds. After his death in 1927, the land was divided up and sold to buyers. A portion was also set aside for the future Post Office at 20-20A Mokoia Road. The site where the homestead was is now around where the Rawene Chambers are, and the gravel carpark next to them. Highbury Corner has served as the commercial heart of Birkenhead for 80 plus years. The shops in the buildings around the corner play a very important part in the atmosphere and spirit of the village. Today, the corner is still greatly important to the workings of the village.